Is Warner Bros. Doing a Poor Job Marketing the Wonder Woman Movie? The trailers are funny, which is good to see because that’s something the DCEU’s been sorely lacking, but they’re also stylish and action packed. I also appreciate that neither these nor the full trailers have given away too much story. We don’t even have an official look at Ares in full on Ares mode yet, and that shows some admirable restraint. More importantly, these new trailers are telling me exactly what I want to hear about the Amazons and Wonder Woman, namely that the Amazons were created to bring peace to the world and that Diana is their champion for this cause. The “Power” spot has the tagline “There is a power greater than man,” which is perfect, and it’s hard not to get excited when you hear Wonder Woman say, “I will fight for those who cannot fight for themselves.” That’s who Wonder Woman is, and it’s encouraging to see that they’ve captured the essence of the character in this way. However, while the trailers are fantastic, there’s been some concerns in the fan and film communities about Wonder Woman‘s lack of marketing more broadly. We’re only a month out now and we’re just starting to see TV trailers roll out, plus there seems to be a lack of Wonder Woman product branding, tie-ins, and what have you. Others suggest that the film is about on track, with Warner Bros. having spent the same amount of money a month out with Suicide Squad as they have thus far with Wonder Woman. There are interesting points on either side of this issue across myriad posts you can read at your leisure. Having followed Wonder Woman closely, I fall on the side of being underwhelmed by the marketing thus far. Just over a year ago, I was up to my ears in Batman v Superman: Dawn of Justice paraphernalia. That movie was EVERYWHERE, not just in theater and television advertising but in piles upon piles of branded products, toys, and other items. There were cereals, for goodness sake, one for Batman and one for Superman. And the marketing team made a big show of sending them out to notable folks in a special box so that they’d share it on social media. It was all a bit goofy and over the top, and the flavours of the cereal sounded disgusting, but it speaks to the omnipresence of the Batman v Superman marketing that their weird cereals got such a massive push. Wonder Woman doesn’t have her own movie branded cereal. In fact, she’s got little in the way of any grocery item tie-ins, apart from Dr. Pepper. Wonder Woman is different than Batman v Superman in little ways as well, like Lego, for example. Batman v Superman got three different Lego sets, while Wonder Woman has only one. It looks super rad, with Ares and Steve’s plane and such, but it’s still just one set. A month before Batman v Superman, you could walk through any major store, be it grocery or big box generally, and see Batman and/or Superman stuff EVERYWHERE. We were inundated with it. A month out from Wonder Woman, the Wonder Woman items are few and far between. Now, I don’t think that Warner Bros. is intentionally trying to tank Wonder Woman or anything nefarious like that. But I do think it’s clear that they allotted far, far more resources and effort to their dumb movie where the superhero boys punched it out than they have to Wonder Woman. And this is somewhat troubling, because even with all that effort, Batman v Superman only did about fine at the box office. It made Warner Bros. a good amount of money and obviously the franchise is continuing, but it wasn’t near major Marvel levels despite the fact that it starred the two most famous superhero characters in the universe. With all of that marketing effort behind it, Batman v Superman still got bested by the lower budget, R-rated Deadpool in the United States. The thing is, Batman and/or Superman can have a mid-level performance at the box office and be fine. We’ve seen it several times over. Batman & Robin sucked? Don’t worry, here comes the Nolan trilogy. Superman Returns flopped? Don’t worry, here comes Man of Steel. Warner Bros., and studios generally, are dedicated to their male characters. This is not the case with female characters. 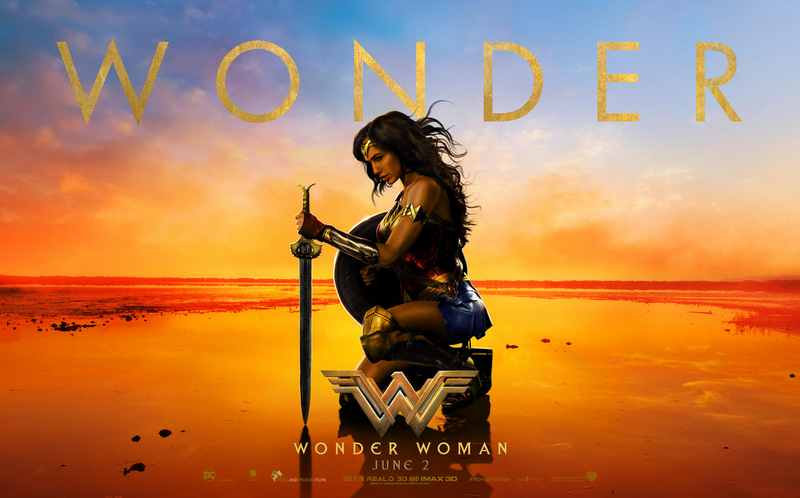 If Wonder Woman doesn’t do well, it might be a long time before Warner Bros. takes another crack at her, and it would certainly hamper the chances for future female-led superhero films. That’s why the underwhelming marketing for Wonder Woman thus far is a concern. An aggressive marketing push can really help a film succeed, but the studio seems to be taking a more relaxed approach. It feels like a missed opportunity on multiple levels. First, strongly pushing Wonder Woman would show that Warner Bros. is committed to Wonder Woman and female leads generally, which would have been nice to see. Second, a successful Wonder Woman would inevitably come with a strong female fanbase that could even further expand the audience for the DCEU, which would be great for the studio. And third, after decades of development, they’ve finally got a Wonder Woman movie and it looks really good, so it would make sense to set it up in the best position possible. And Warner Bros. isn’t quite doing that, relative to how they’ve promoted movies in the past. The good news is that Wonder Woman does look great. The new trailers are fantastic, the movie feels exciting and cool and different, and the buzz has been very positive thus far. I’m optimistic not only that the movie will be good, but that it will do well. It just would have been nice to see more of a push from Warner Bros. to help ensure that it does more than well. Hopefully it does so on its own merits, and maybe we’ll see lots more promotional stuff roll out in the weeks to come. It just doesn’t feel like Warner Bros. has treated Wonder Woman like the landmark movie it should be. This entry was posted on May 2, 2017 at 3:34 pm and is filed under Movies, WW Miscellany. You can follow any responses to this entry through the RSS 2.0 feed. You can leave a response, or trackback from your own site. I was just talking about this, and a friend mentioned maybe they are waiting for GOTG to launch this week. Still BvS was still wayyy more pushed. However, I’m hoping they are right and next week we see a launch. I noticed the DC Store launched new WW stuff yesterday and then sent an email about it today. So here’s to hoping, but yeah, as usually, I agree with everything you say. Wonder Woman is an after-thought to Batman & Superman. In fact when a new licensed product gets released, Batman and Superman gets first dibs because they sell way more than any other DC superheroes. Green Lantern and The Flash are considered followed by Justice League and then Wonder Woman is considered, especially for male-oriented products. An example would be a barbecue tool set vs a barbecue apron. I’ve worked with major companies that wouldn’t touch Wonder Woman unless a movie is coming out. I know this is hard to swallow: Wonder Woman is not a safe bet compared to Batman or Superman. If the JL movie came out BEFORE the Wonder Woman movie and did well, my hunch is WB would have used that movie as a better gauge for how WW could do in a stand-alone movie. BvS isn’t enough to go by so I’m not surprised WW is lukewarm. I would compare WW movie to Marvel taking a chance with doing a movie about Thor. They just weren’t sure. If Wonder Woman’s marketing budget is really the same as Suicide Squad’s, I’d say Warners didn’t get their money’s worth. I was thoroughly sick of SS by the time it finally debuted. Everyone knew everything that was going to be in SS before it opened. With Wonder Woman, I’ve seen enough to be intrigued (Themyscira) and worried (why WW I?). BTW, I’m not that surprised that Wonder Woman has less tie-ins than BvS. The latter had three times as many heroes (though of course only Wonder Woman was universally hailed). Dziękuję nadzwyczaj w środku bajerancki tekst. Tego właśnie potrzebowałem. Jeśli chcesz owo polecam Fajne pozycjonowanie w charakterze dobrą formę reklamy. It maybe just me but I actually saw a lot Wonder Woman Merchandise going around except in grocery items which really didn’t bother me. Lots of clothes, toys, and book tie ins. As well girls wearing Wonder Woman jewelry.